Above: Jerry Blumenthal of Kartemquin Films and Jeff Spitz, Executive Director of Groundswell sit on a panel discussion about documentary and social change. Groundswell co-founder Jeff Spitz presented a rough cut screening of our upcoming documentary “Robben Island Singers” at the Amnesty International Human Rights Art Festival on April 24th. It was the first time a rough cut has been publicly screened and was met with a very positive reaction from the audience. Afterward, the audience was eager to discuss the over-arching themes presented in the film: apartheid, violence, forgiveness and self-actualization in two very different worlds: South Africa and America. The film tracks the journeys of three South African ex-political prisoners once imprisoned with Nelson Mandela after fighting Apartheid. The singers have brought their message and the music that sustained them while in prison to American schools in a revolutionary cultural exchange program. 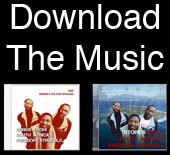 More information can be found at the project’s website, www.RobbenIslandSingers.com, which also offers their music for purchase or download.